The RRD Firemove 110 is by far the widest freeride/freemove board within the segment with 75 cm compared to Fanatic Hawk 65 cm and Tabou Rocket 66 cm, at the same time one of the shortest. The RRD Firemoves width in combination with extremely thin profile provides great control and a sporty feeling. 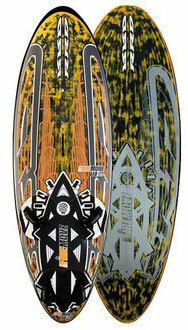 The RRD Firemove is a maneuver oriented freeride/freemove planing machine with +30 knots potential. The RRD Firemove 110 is very wide across the middle as well as short, with a rounded shape. The RRD Firemove hull shape and width works effectively to help the board quickly up onto the plane and it accelerates rapidly up through the gears, with an impressive top speed. Round the corners the RRD Firemove is a very rewarding board that is highly versatile. The rounded shape makes it super manoeuvrable and gives it an extremely playful nature. The RRD Firemove really delivers and comes highly recommended to riders that want a high performance manoeuvre orientated board that doesn’t sacrifice speed. Jem Hall: I use the RRD Firemove 110 mainly, for coaching and freesailing back in the UK, as it feels around 125 litres, planes like a 135 and gybes like a 110 – so versatile, fast and fun. I use the Firemove as I can have fun going fast, plane early and really crank into gybes. With the middle strap setting, not too far outboard or inboard, I can also do carving 360s, jump and loop it. John Skye: The RRD Firemove 100 is so versatile I have used it in loads of different conditions. Everything from small waves, bump and jump style, through to flat water slalom style blasting with big sails. As the Firemove is wider than normal, you have to basically add about 10-15L to the volume to get an idea of its relative size. For example the 100, which is the board I used the most, is actually much closer to a 110-115 board.